He already knows what he wants to be when he grows-up. He sees it on his nightstand every morning when he wakes up. It’s something that lives inside of him. He’s only seven but wants to dip his wings in Heaven. He hears the same whispering voice. And he’s already made the choice. Every time he sees a Blue Angel Aircraft pass. It’s part of his destiny. He’ll hear the same voice before he turns twenty-seven. Just as his father before him. He walks outside and looks up to the morning blue sky. He bravely looks up and says, daddy, I want to be just like you. I have the same power living in me that lived in you. I want to be a United States Navy Blue Angel pilot, just like you. He already feels that burning desire. He’s a special chosen few. He’s already brushing his hand across his built Blue Angel toy. To him it’s way more than just a toy. It’s the same dream his father had living inside of him. It’s a little boy living his dream. 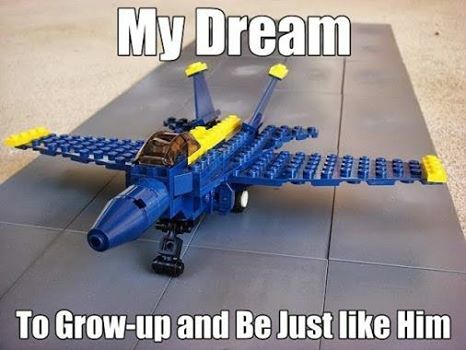 To one day grow-up to be a United States Navy Blue Angel.